I've been hearing a lot of fabulous things about the tiny brick oven pizzeria on Astoria Blvd called Basil Brick Oven Pizza. Many friends of mine had nothing but great things to say, and after my salsa class at Simply Fit Astoria, I decided to pop in for a bite. Although my first gut was to get take out, as I was on my own, Basil is really small and intimate, and so very endearing that I was inclined to stay. Why not, I thought, relax and eat in peace after a long day. The space fits only about 3 four-top tables and one or two additional two-tops. The gorgeous brick oven is situated at the very back of the narrow room, but it's nicely exposed for all to admire. Casual and friendly, the vibe proves this to be a place of respite for solo diners and small parties too. Being that Brick Oven is situated on the ground floor of an apartment building, I imagine they get a lot of residents that are regulars. It's clear from the menu that the pizza is the star of the show, as there are 40 different options. Yes, you heard me right...40! But even though some of their creative pizza combinations were definitely calling my name, I decided to go with a panini instead. 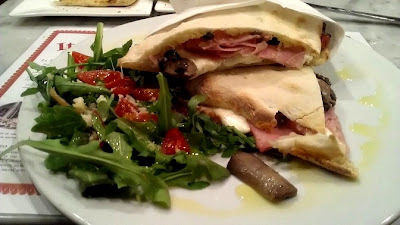 Toscano Panini - When I noticed that this panini included a combination of champignon mushrooms, ham, and homemade mozzarella, I was in. When it arrived, I was really happy to see that it came with a side salad of arugula, cherry tomatoes and fresh parmesan. It was lovely and crisp and the perfect way to supplement the substantial panini. So about that...I just couldn't believe how huge the panini actually was! It came with two large pieces that could very well be split among two people, and I only ate a half and took the other home for Dan. All the ingredients inside the sandwich were spot on - the mozzarella was especially tasty, milky white and elastic, while the ham was gently smoked. The mushrooms were my favorite filling, meaty and chunky bits that made the sandwich that much more substantial. But the real stand-out of the whole thing was the thin bread that was slightly charred on the outside from the brick oven - it was thin, crispy and pretty similar to thin pizza dough. Despite the small space, there were quite a lot of attentive waiters. The place wasn't too busy, but still, there was a lot of attention paid to each patron and the minute I drained my glass of water, it was refilled instantly. The staff was approachable and friendly and made each customer feel comfortable and appreciated. I heard some of them speaking in Italian which showed me this was the real deal.